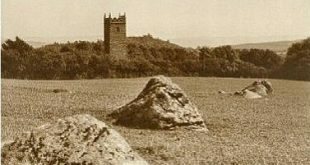 “It is now known as Grims-grove, that is Grim’s Grave, and has been looked upon as probably the last resting-place of a Viking of that name, who fell in the battle which gave the upper part of the Plym its name of cad, or battlefield,” 1895, p.263. Page gets this idea from an antiquarian called Spence Bate who took the place-name element ‘grim‘ to suggest a Viking origin. Originally, Spence Bate considered that the Grimspound settlement was built to securely store tin by the Norsemen. Linked to this theory was the discovery of a sword at Hambledon barrow that had, in his opinion, a distinct Scandinavian character. He also believed that the chieftain of this barbarian hoard was buried under King’s Barrow from which it took the chieftains name. The Vitifer mine was also supposed to be of Viking origin as the Norse word vittefleur meant ‘white stream’, this being synonymous with the china clay that gave the stream its white hue. So here is how the early Viking link came to be associated with Grim’s Grave. So, we are not looking at a Viking burial mound although the shape could be suggestive of a boat burial. Grim’s Grave is a probable Bronze Age funereal structure more commonly described as a ‘Retaining Kerb Circle’. It consists of a circle of 9 ‘kerb stones’ inside which sits a kistvaen which is in remarkable condition. The slabs which line the kist are in position and there are the remnants of the two capstones which covered the grave. Sadly, the ‘tomb raiders‘ have been at work and it is they who were probably responsible for smashing one of the capstones. The grave was re-excavated by Worth who merely found a single flint flake on the nearby surface which is more than likely out of context and came from the original cairn robbing. The location of this monument is partway down the valley and slightly uphill of the brook which is slightly surprising when the locations of other moorland kistvaens are taken into account. The 3D topographical map below shows how far down in the valley Grim’s Grave is located. Taken on its own Grim’s Grave is simply an excellent example of a kistvaen but when the whole landscape of the Langcombe Valley is considered this is then but 1 of a whole series of kists which make up a ritual landscape. There are in fact 10 other kistvaens located in the valley and its tributary valleys as can be seen in the map below. This would suggest that the area was at one time looked upon as a special place for burial. Compared to the sizes of the settlements further down the Plym these in the Langcombe Valley are significantly smaller. Early theories were that the huts were associated solely with funeral activities and that two of the structures were used for cremation prior to kist internment. Again, all the other cairns and kists had at one time been broken into, however the most easterly of the two kists on the western side of Deadman’s Bottom‘ did reveal numerous fragments of a decorated pot, a Bell Beaker, plus three barbed and tanged arrowheads in perfect condition. This excavation was once again carried out by Worth and the finds have at least put a suggested Bronze Age date on the kist of post 2,500 BC. With such a name one would have though that myths and legends abound around Grim’s Grave but I have been unable to find anything, not even a marauding Viking up Deadman’s Bottom. There was some early confusion insomuch as at one time Grim’s Grave was taken to be the Grymsgrove of the perambulation of 1240 which we now know is about half a mile away at Erme Head. Local tradition would have it that in the 1970’s, Grim’s Grave was the meeting place for a coven of witches from Plymouth. One of their rituals coincided with a night exercise held by the Royal Marines who crept unseen upon them. Once the soldiers became bored of watching the naked women frolicking around the huge fire they managed to lob a couple of thunder-flashes into the flames. The resulting explosions sent the ‘weird sisters’ into hysterics as they probably thought the ‘Dark One’ was about to ascend into their midst. Butler, J. 1994 Dartmoor Atlas of Antiquities, Vol. III, Devon Books, Exeter. Page, J. Ll. W. 1895 An Exploration of Dartmoor, Seeley & Co, London.